↑ The most recent edition, in three volumes, is that of David Womersley. For commentary on Gibbon's irony and insistence on primary sources, see Womersley, "Introduction". Gibbon's caustic view of Christianity is in chapters XV and XVI, and Gibbon rarely neglects to note its influence in the later volumes of the Decline and Fall. 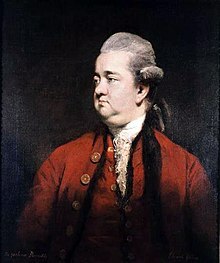 ↑ Edward Gibbon (1779). A vindication of some passages in the fifteenth and sixteenth chapters of The history of the decline and fall of the Roman Empire: By the author. Printed for W. Strahan; and T. Cadell, in the Strand. ↑ The New Schaff-Herzog Encyclopedia of Religious Knowledge, vol. IV, eds. S.M. Jackson et al. Grand Rapids, Mich.: Baker, 1952, 483–484. online. Womersley, David, ed. 1994. The History of the Decline and Fall of the Roman Empire. 3 vols. London: Penguin. This page was last changed on 31 August 2017, at 00:51.